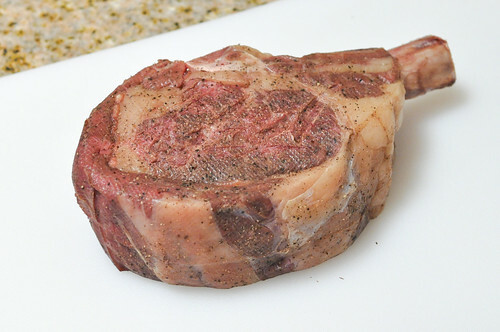 While the most profound sous vide application may best represented in long-duration braises of the tougher cuts, breaking down connective tissues while keeping meat a medium-rare temperature, its applications for “simpler” cooking can be just as rewarding. For example, a steak can be prepared very well either on the stove top or seared and finished In the oven/broiler, but I often like to prepare one sous vide. There are a few reasons why. One, like all sous vide cooking, it ensures precision in cooking temperatures. Even with a thermometer I still sometimes mess up and overcook a steak, something I consider a big no-no. 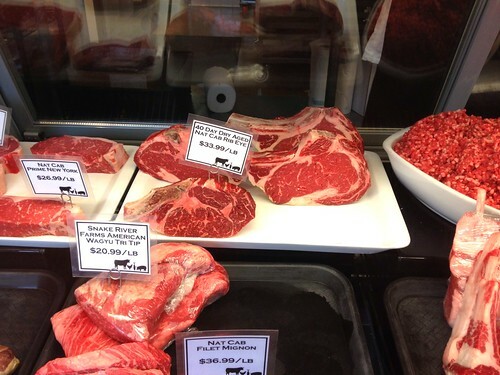 Steaks can be some of the most expensive meats at the market, so I consider the extra time a worthwhile investment to get it just right. Another is that I think it keeps a steak juicier. I don’t know the exact science behind it, but cooking at a lower temperature minimizes moisture loss in the muscle fibers; when cooking steaks sous vide, there’s rarely more than a couple of tablespoons of juice left in the bags after cooking. 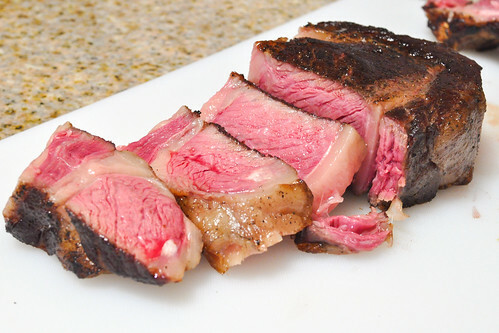 My latest venture into sous vide steak utilized a 40-day dry aged Angus rib-eye from one if my favorite butchers in the city – McCall’s Meat & Fish Co. They’ve always got top-notch proteins and just started serving some great baked goods too (wife McCall was a pastry chef at Daniel in NYC and Sona in LA). 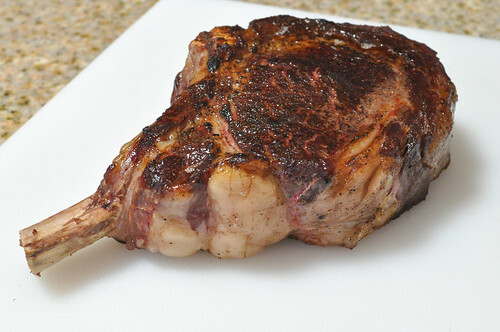 The dry aged steak is one of the primo cuts of meat they have on a daily basis; they cut a piece almost two inches thick on the spot for me…resulting in a two-pound slab of beautiful meat. As with any good piece of meat, not much needs to be added when cooking. I seasoned generously with salt, pepper, and garlic powder and sealed this bad boy up. Fresh herbs are optional. I placed the steak in a 130F water bath for 5 hours. My sous vide timetables indicated it would take approx. 3.5 hours to come to temperature, but I let it sit in there a little longer for good measure. Once ready, the steak just needed to be dried and seared. The residual juices in the bag (of which there were only a 2-3 tablespoons) could be served with the steak, used in a sauce (briefly microwave then filter to remove coagulated proteins), or just discarded. 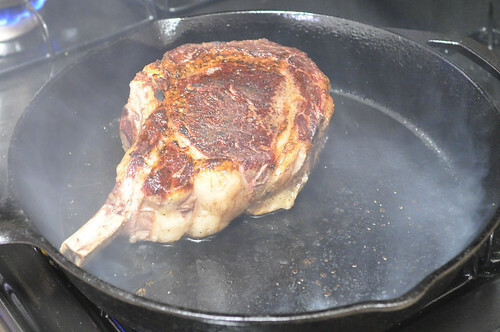 I’ve found that searing in a cast iron pan (as hot as possible) with oil gives me the best crusty sear. Torching only just doesn’t get the desired crust, but I do often use it to supplement the cast iron pan. It’s done! The steak was so juicy, glistening as I sliced into it – a good rib-eye is of course going to be pretty juicy, but I think it was enhanced by the low-temperature cooking method. I sacrificed a very small amount of medium-rare meat to ensure a great crust, something I considered worthwhile given the thickness of the steak; the enhanced flavor and the texture of the seared edges really made a difference. 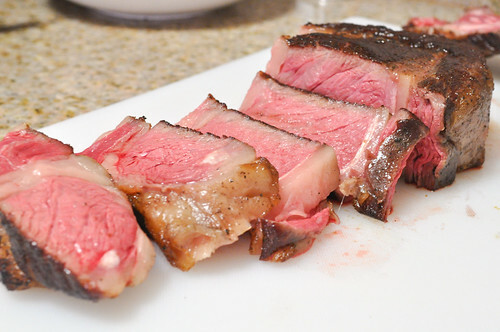 Cooking a steak sous vide does not make a world of difference from conventional methods (not like, say, sous vide beef short ribs), but there are definitely worthwhile benefits to doing so if time permits. You know what, I haven’t. From what I’ve read it doesn’t sound like it makes much of an impact, but if the folks at Modernist Cuisine say so, maybe it’s worth a shot. 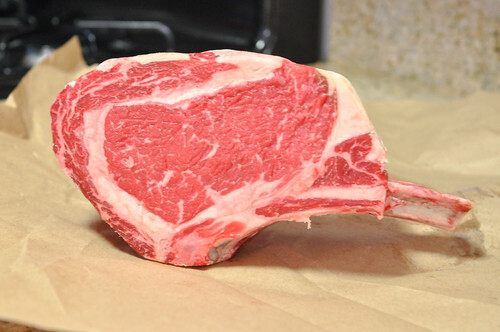 How thick how the rib eye? It was probably a good inch and a half.